A colour photograph of 320 St. John Street West. View is of the front of the house. 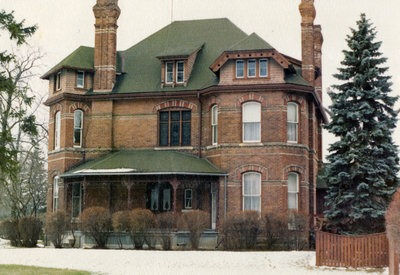 This brick house was built circa 1881 at the north east corner of King and St. John Streets. This home was originally designed for Judge George H. Dartnell (who died in 1899) by Henry Langley (Toronto architect). Kirk, Robert ; McIntyre, Duncan J. 320 St. John Street West, 1977, Robert Kirk. Whitby Archives D2013_005_006.